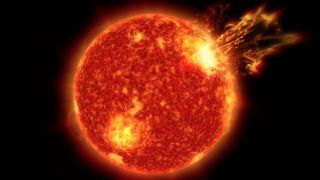 Artist's illustration of a superstorm erupting from the sun. Life on Earth may owe its existence to incredibly powerful storms that erupted on the sun long ago, a new study suggests. Potent and frequent solar eruptions could have warmed the planet enough for life to take root, and also provided the vital energy needed to transform simple molecules into the complex building blocks of life, such as DNA, researchers said. "That means Earth should have been an icy ball," study lead author Vladimir Airapetian, a solar scientist at NASA's Goddard Space Flight Center in Greenbelt, Maryland, said in a statement. "Instead, geological evidence says it was a warm globe with liquid water. We call this the Faint Young Sun Paradox." Airapetian and his colleagues may have an explanation for this paradox. The scientists analyzed observations made by NASA's Kepler space telescope, which hunts for exoplanets by looking for the tiny brightness dips these worlds cause when they cross their host stars' faces. Kepler observed some stars that are similar to the sun, but much younger — just a few million years old, compared with 4.6 billion years old for the sun. The Kepler data suggest that newborn sun-like stars tend to be extremely active, blasting out flares (bursts of radiation) and coronal mass ejections (CMEs, which are clouds of superheated plasma) far more often than their older counterparts do. For example, the sun currently fires off enormously powerful "superflares" perhaps once every 100 years. But the young stars Kepler observed erupt with such megastorms up to 10 times per day. If the sun were similarly active in its youth, the effects on the early Earth would have been dramatic, study team members said. "Our new research shows that solar storms could have been central to warming Earth," Airapetian said. Fast-moving charged particles blasted out by solar storms would have penetrated deeply into the atmosphere back then, because the planet's magnetic field — which deflects most such particles today — was significantly weaker, researchers said. These deep-diving particles would have broken many of the double-nitrogen molecules into single nitrogen atoms, which, in turn, would have split atmospheric carbon dioxide molecules into carbon monoxide and atomic oxygen. Much of the free-floating nitrogen and oxygen would then have combined into nitrous oxide — a greenhouse gas 300 times more potent than carbon dioxide. "Changing the atmosphere's chemistry turns out to have made all the difference for life on Earth," Airapetian said. CMEs that hit Earth directly can trigger powerful geomagnetic storms that can disrupt power grids and satellite navigation, as well as ramp up the gorgeous auroral displays known as the northern and southern lights. Today, the auroras are usually confined to high latitudes, because Earth's strong magnetic field channels charged solar particles toward the poles. But the light shows would have been more dramatic and widespread early in the planet's history, because of the more-powerful solar storms and weaker magnetic field, researchers said. "Our calculations show that you would have regularly seen auroras all the way down in South Carolina," Airapetian said. The fast-flying solar particles may also have been the source of energy needed to turn simple molecules (which were abundant on the early Earth) into complicated organic compounds such as DNA and RNA, study team members said. But all of this is not to suggest that solar storms are unequivocally good for life. Too many mega-CMEs, for example, could tear away a planet's atmosphere, especially if that world doesn't have a strong magnetic field. "We want to gather all this information together — how close a planet is to the star, how energetic the star is, how strong the planet's magnetosphere is — in order to help search for habitable planets around stars near our own and throughout the galaxy," study co-author William Danchi, principal investigator of the project at NASA Goddard, said in the same statement. "This work includes scientists from many fields — those who study the sun, the stars, the planets, chemistry and biology," Danchi added. "Working together, we can create a robust description of what the early days of our home planet looked like, and where life might exist elsewhere." The new study was published today (May 23) in the journal Nature Geoscience.